Different student groups could each plot the original datasets and discuss; this figure could be later provided as an easy takeaway summary of their efforts. 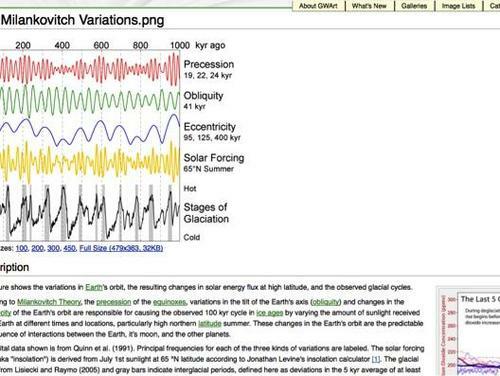 Figure that shows the variations in Earth's orbit (precession, obliquity, and eccentricity), the resulting changes in solar energy flux at high latitude (solar forcing at 65 degrees N), and the observed glacial cycles. Also includes a graph of the last 5 glacial terminations. Comments from expert scientist: Covers appropriate material, but has some confusing wording. Generally speaking, the scientific information is correct, but it is not very in-depth and doesn't tell the whole story. Good background information for students and teachers. The "backwards" timescale, while potentially confusing, is the convention in paleoclimatology.